During a decade when economic inequality grew by leaps and bounds in the rest of the world, it declined significantly in Latin America. 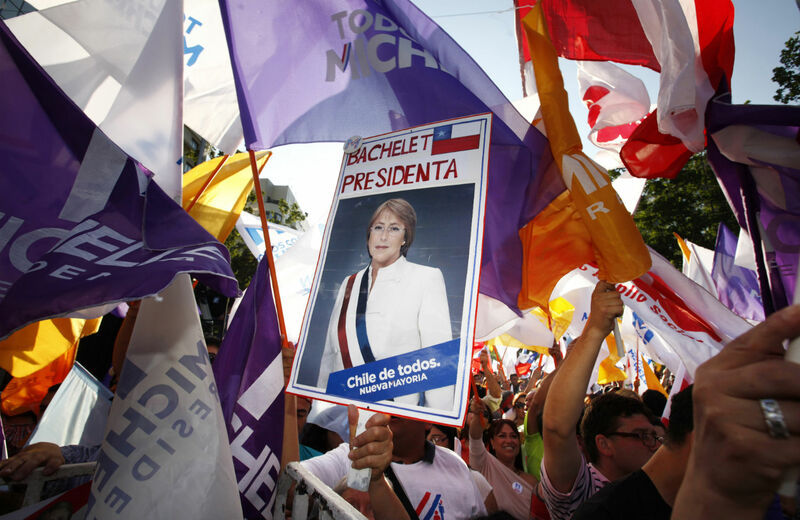 With those words, Michelle Bachelet returned to the presidency of Chile this week. The Socialist leader has vowed to put inequality at the top of her agenda. In doing so, she is hardly alone among Latin American leaders. Latin America has long been one of the most unequal areas of the globe. But during the past decade, the region has witnessed a remarkable turnaround. Economic populism has swept the continent, leading to the election of left-of-center political parties that have implemented anti-equality agendas. Their efforts have borne fruit. During a decade when economic inequality grew by leaps and bounds in the rest of the world, it declined significantly in Latin America. Last year, the World Bank reported that the region’s Gini coefficient, a statistic that measures inequality, decreased from 58 in 1996 to 52 in 2011. During the 2000s, Gini coefficients declined in thirteen of seventeen individual Latin American countries as well. In that same decade, rate of extreme poverty (people surviving on less than $2.50 a day) was cut by 25 percent to 13 percent. Those at the bottom 40 percent of the income scale also made impressive gains—their average income rose by 5 percent, as opposed to 3 percent on average for the population as a whole. What’s the secret of Latin America’s success? Partial credit is due to the healthy economic growth the region saw over the past decade—about 4 percent on average—spurred by a strong worldwide demand for the region’s commodities. But of course, just because growth occurs, there’s no guarantee it will be equitably shared. For example, in the US between 1975 and 2009, GDP per capita growth was 1.9 percent, but growth in median household incomes was only 0.5 percent. Moreover, there is mounting evidence that equality itself helps drive growth, and inequality puts the brakes on it. – Redistribution government transfers have been very important. Welfare cash transfer programs such as Bolsa Familia in Brazil, Opportunidades in Mexico, and similar programs in Argentina and Bolivia have lifted millions of people out of poverty. – The expansion of educational opportunity has also been key. Some of the transfer programs, such as Bolsa Familia, pay a stipend to families who allow their children to stay in school. This has resulted in rising levels of educational attainment and skilled labor. Highly skilled labor has become more abundant relative to low skilled labor, reducing.the premium for high skilled workers and creating more equality. – Labor market institutions have also played an important role, particularly in Argentina, Bolivia, and Brazil. Minimum wage hikes and stronger unions have increased the earnings of low-earning workers. It’s well worth emphasizing that the anti-equality agenda these countries have adopted marks a sharp break with the neoliberal “Washington Consensus” of the 1980s and ’90s: austerity, privatization, deregulation and the like. In 2003, Argentina’s Kirchner and Brazil’s Lula even signed a document, the Buenos Aires Consensus, which explicitly rejects the policies of the Washington Consensus. In previous decades, neoliberal policies had been adopted throughout Latin America, but they brought recession and suffering rather than prosperity. The 1980s was a “lost decade” and the 1990s weren’t much better. Widespread popular discontent with the fruits of neoliberalism led to the elections of economically populist governments throughout Latin America beginning in the early 2000s. Perhaps the most successful of these is the government led by Bolivia’s Evo Morales. Morales, ironically, has been among the Latin American leaders who has strayed furthest from the Washington Consensus. His government has nationalized major industries (the state now controls 34 percent of the economy) and closed its borders to some imports. Between 2002 and 2010, the Bolivia’s poverty rate was cut by a third, and in 2009, UNESCO declared the country illiteracy-free. Economic growth was over 5 percent last year and has averaged above 4.5 percent during Morales’ presidency. Though great progress in the fight against inequality in Latin America has been made, serious challenges remain. Latin America is still, along with Africa, the most unequal region in the world. Many people living there suffer from desperate poverty, including some 80 million people living in extreme poverty. An economy that goes sour could open the door to right-wing challengers bent on reversing historic gains, as may be happening in Venezuela. For now, though, Latin America’s egalitarian renaissance appears to be going strong. Countries like the US, where inequality continues to spiral, could do worse than to take a close look at the egalitarian policies that have worked for Latin America, and adopt them as their own.